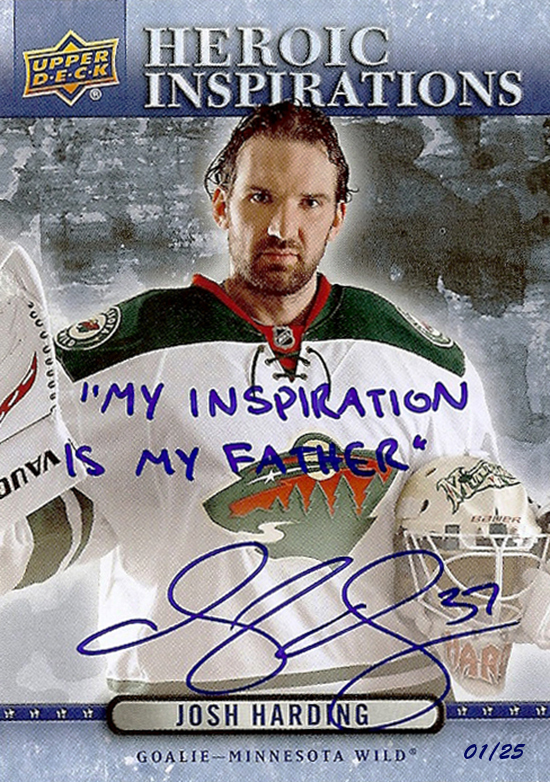 Josh Harding, the Inspirational Minnesota Wild Goalie, Receives a Special Tribute Card from Upper Deck! CARLSBAD, Ca. (September 09, 2014) – Josh Harding is a goalie for the Minnesota Wild® who was diagnosed with Multiple Sclerosis in November, 2012. In his first game back post-diagnosis, Harding faced the Dallas Stars™ and stopped all 24 shots for a 1-0 shutout win. Harding was awarded the 2012-2013 Bill Masterton Memorial Trophy for his perseverance, sportsmanship and dedication to hockey. With that, he became an inspiration for the MS community and hockey fans everywhere. To pay tribute to Harding’s courage in the face of such adversity, Upper Deck has created a “Heroic Inspirations” trading card that Harding has autographed and inscribed. The goal of the card is to give people suffering from MS hope and to raise awareness for Josh Harding’s charity; Harding’s Hope (www.hardingshope.org) To start the campaign, Upper Deck has inserted 25 of the cards into packs of the 2014-15 NHL® O-Pee-Chee series. Harding included his signature and an inscription on these cards, “My inspiration is my father.” Harding has signed and inscribed other versions of the card with some of his other inspirations. These additional autographed and inscribed cards will be available with a donation to the charity through the Harding’s Hope website at the start of the 2014-15 NHL® season. Upper Deck has produced other Heroic Inspirations-themed cards in the past for other inspirational athletes. Harding’s card is the first in the series that features an autograph from the athlete and an inscription. Upper Deck’s 2014-15 NHL® O-Pee-Chee arrives in hobby and retail stores today! Harding’s Hope is a nonprofit founded by Minnesota Wild goalie Josh Harding, 2013 Bill Masterton Memorial Trophy Winner. Harding’s Hope is raising awareness about multiple sclerosis (MS) and raising funds to support people living with MS. Josh Harding founded Harding’s Hope because he was thankful for the support he received from family, friends, medical staff, and the hockey community after his MS diagnosis. Harding quickly recognized that not everyone living with MS has a team supporting them, and that many people are faced with making a choice between paying for MS treatment or meeting day-to-day expenses. Harding’s Hope is not funding MS research. Harding’s Hope is focused on supporting individuals and families living with MS who are struggling with the costs of treating the disease. You can help Josh help others. Read more at www.hardingshope.org or Twitter (@HardingsHope) or Facebook (Harding’s Hope).